Shareholders lost their sunny disposition for this solar power-oriented manufacturer last mont,h thanks to two SEC filings. Partially giving back the gains they made in November thanks to a strong Q3 earnings report, shares of Enphase Energy (NASDAQ:ENPH) sank 12% in December, according to data from S&P Global Market Intelligence. Although shares have soared throughout 2018, investors seemed unable to overlook two of the company's filings with the SEC in the last month of the year -- filings that provide insight into how the company plans to keep the lights on in the days to come. In the first filing, Enphase revealed a sale of $5 million in convertible senior notes that mature in 2023 and carry an interest rate of 4%. This move extends management's recent trend of relying on debt to finance its operations. Over the past 10 quarters, for example, the company's total debt has increased from $12 million at the end of Q2 2016 to $112 million as of the end of the recently completed third quarter, according to Morningstar. But management's interest in raising capital through the continued issuance of debt doesn't mean it's eschewing equity financing. In its second filing last month, Enphase revealed its intent to raise capital through the issuance of 7.5 million shares of its common stock. 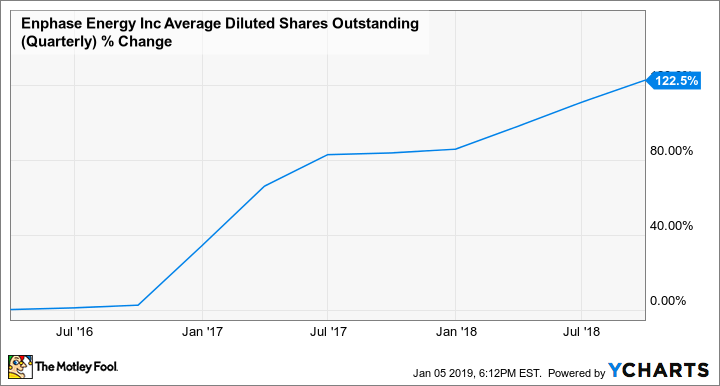 With the company's share count more than doubling over the past three years, it's unsurprising that investors responded unfavorably to the recent news that they would be subject to further dilution. ENPH average diluted shares outstanding (quarterly) data by YCharts. The issuance of debt and equity is hardly a shock, considering the company's financials. Over the past five years, Enphase has average annual net income and operating cash flow of negative-$33.6 million and negative-$11.8 million, respectively, according to Morningstar. But investors shouldn't interpret last month's filing as a red flag. Rather, they should recognize it as a normal course of action for a growing company that's not yet profitable. From here, investors will want to confirm that the company continues to generate strong cash flow as it has done for the past three quarters, so that it can adequately service its debt and move beyond the reliance of issuing debt and equity as a means of raising capital. Check out the latest Enphase Energy earnings call transcript.